Udah lama banget ga posting Wishful Wednesday sampe ketinggalan giveawaynya. Bulan Februari sama sekali ga posting karena hectic abis. So, bulan ini, akhir Maret, gue memberanikan diri untuk ngepost wishlist ke 7. Moga-moga nomor keberuntungan ini bisa membawa berkah bagi kita semua, amen. Go deep into the heart of Mystic Falls with this episode-by-episode look at the first season of The Vampire Diaries. Premiering in the thick of the vampire craze, The Vampire Diaries has proven itself to be much more than yet another addition to the overpopulated, undead pop-culture racket. Its mix of romance, horror, drama, and humor has won it great ratings for The CW, international acclaim, and a growing and devoted fan base. 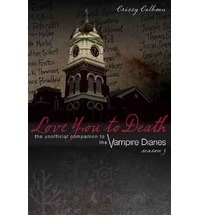 Love You to Death: The Unofficial Companion to The Vampire Diaries is the essential guide to the show, featuring: * the story of L.J. Smith who first introduced Elena and the Salvatore brothers in her best selling book series; * background on Kevin Williamson (Dawson’s Creek, Scream) and Julie Plec (Kyle XY), the masterminds behind the adaptation from page to screen; * biographies of the actors who bring Mystic Falls’ residents to life (. . . or afterlife); * insightful explorations of each episode with information on the rich history, supernatural mythology, film references, character development, and much more; and * exclusive interviews with TVDers, like the much-loved Malese Jow (Anna) and the fandom’s fearless leaders. 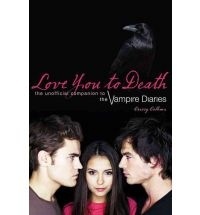 With photos of the irresistible cast and of the show’s filming locations, Love You to Death captures the fun, fangs, and fear that make The Vampire Diaries so epic. 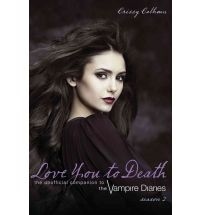 Returning to the haunting hideaway of Mystic Falls, the fictional setting of the CW hit series “The Vampire Diaries,” this new guide promises to further satisfy the show’s many loyal viewers. Garnering huge ratings for the network week after week, “The Vampire Diaries”‘ mix of horror, romance, drama, and self-aware humor has maintained a growing fan base through its second hit season. This volume follows in the footsteps of the previous guide by featuring insightful explorations of each episode’s rich history, supernatural mythology, film references, character development, and much more. Chapters on the vampire, werewolf, and doppelganger lore that inspired the show are included as well as behind-the-scenes details on the making of the series, the people who started it all, and the fandom that keeps it alive. With photos of the irresistible cast and chilling filming locations, this second installment once again captures the fun, fangs, and fear that make this bloodcurdling production so epic. Returning to the haunting hideaway of Mystic Falls, the fictional setting of the CW hit series “The Vampire Diaries,” this new guide promises to further satisfy the show’s many loyal viewers. Garnering huge ratings for the network week after week, “The Vampire Diaries”‘ mix of horror, romance, drama, and self-aware humor has maintained a growing fan base through its third hit season. This volume follows in the footsteps of the two previous guides by featuring insightful explorations of each episode’s rich history, supernatural mythology, film references, character development, and much more. Chapters on the vampire, werewolf, and doppelganger lore that inspired the show are included as well as behind-the-scenes details on the making of the series, the people who started it all, and the fandom that keeps it alive. With photos of the irresistible cast and chilling filming locations, this third installment once again captures the fun, fangs, and fear that make this bloodcurdling production so epic. Gue penggemar fanatik seri The Vampire Diaries. Jujur, gue belum pernah baca bukunya (lagi ngumpulin cicis untuk beli bukunya). Pas lihat ada TV series companionnya, gue langsung mupeng berat. Mystic Falls Guide sih gue udah dapat, beli murah banget di Periplus PIM. Sepertinya bakal lama banget kalo nunggu ketiga buku ini disale ama Periplus. Gue harus punya ketiganya, dan seru banget pastinya sambil rerun The Vampire Diaries dan ter-mermerized oleh Damon Salvatore berulang-ulang. Posted on March 27, 2013, in Uncategorized and tagged blog hop, Books to Share Blog, Wishful wednesday, wishlist. Bookmark the permalink. 5 Comments. judulnya nusuk banget, love you to death. aku malah belum pernah baca/nonton vampire diaries nih…bagus ya yus? welcome back to Wishful Wednesday ya!